This article highlights some of the challenges facing history teachers in designing and assessing heritage investigation projects in the Further Education and Training (FET) band and the need for teachers to be proactive in terms of their professional development. It also explores ways in which open distance learning (ODL) can address these challenges by providing guidance, encouragement, practical skills training and resource material, especially to those teachers who cannot take their learners to a museum or heritage site for material or logistical reasons. The article is anchored in a qualitative research methodology and reports on student feedback on the Short Course in School History Enrichment offered by the Department of History at the University of South Africa (Unisa) as well as ongoing inquiry into teacher experience of teaching heritage investigation. It also shares the author's personal reflections based on informal communication with course candidates and other teachers over a period of more than ten years. The article argues that ODL can play a significant role in history skills development at secondary school level in general and in enhancing the self-confidence and skills of teachers having to teach heritage investigation in particular. It also emphasises the value of informal partnerships between the ODL institution and role players in the heritage field and makes a plea for closer cooperation between academic historians, history teachers, the Department of Basic Education and the heritage sector. Keywords: Heritage; History; Open distance learning; ODL; Unisa History Department; Short Course in School History Enrichment; Teacher training, FET; Museums; Heritage sites; Electronic resources. This response from a histor	y teacher who completed the Short Course in School History Enrichment offered by the History Department at the University of South Africa (Unisa) in 2010, succinctly captures the candidate's initial anxiety about not knowing quite how to handle heritage in the history classroom, his growing confidence and professional competence as a result of enrolling for skills development via open distance learning (ODL),3 and his ultimate triumph in achieving greatly enhanced learner performance. Far from being an isolated example, the views expressed in the quotation have been confirmed by qualitative research conducted in the Unisa History Department between 2009 and 2011, the findings of which are discussed in this article. The article highlights the main challenges facing history teachers having to teach heritage investigation in the Further Education and Training (FET) band and explores the value of ODL in empowering them to design and assess heritage projects more effectively and creatively. It shares some of the ODL techniques which have been employed by the Unisa History Department to achieve this objective and offers suggestions for closer cooperation between academic historians, education officials and heritage professionals in order to provide teachers with clearer guidance and additional resource material, especially in cases where a class visit to a museum or other heritage site is impossible. Finally, it emphasises the role of the individual teacher who has to take initiative and responsibility for his or her own professional development in order to remain motivated and provide learners with a memorable experience. To complicate the matter even further, the DoE's draft Curriculum and Assessment Policy Statement (CAPS) for history has recently confined heritage investigation to Grade 10, offering no clear guidelines with regard to content and methodology other than insisting on a research component aimed at teaching research skills.13 Although research skills are certainly lacking in many schools,14 and it therefore makes sense to include a compulsory research-based heritage investigation assignment in Grade 10 where the syllabus is not so full and teachers have more time to teach heritage thoroughly, one cannot help but fear that the CAPS document, if implemented unchanged, will eventually cause heritage to be completely sidelined in Grades 11 and 12. It is against this backdrop that the Department of History at the University of South Africa (Unisa) decided to step in and assist history teachers via open distance learning (ODL) in teaching history and heritage more effectively and creatively. Qualitative research conducted in the Unisa History Department during 2009 indicated that the Department's Short Course in School History Enrichment (SCHE016)19 - a non-formal short learning programme which functions as a "community engagement"20 project in terms of university policy and is aimed at supporting and empowering history and social science teachers through practical skills training21 - had been very effective over a period of ten years.22 Respondents23 found the tutorial material of the three syllabus-related course options24 accessible, learner-centred and of high quality.25 They also reported having developed a much more interactive, learner-centred approach to teaching and an improved ability to stimulate classroom debate, instil values and shape attitudes as a result of the course.26 Not only had they gained much needed resource material, but had also acquired fresh ideas to conduct group work, handle oral research and teach source-based and extended writing. They had also learnt to think more creatively, analyse and interpret historical sources more effectively, and implement a wider variety of assessment strategies.27 On a psychological level, both teachers and learners felt more empowered, more motivated and more self-confident as a result of the course,28 all of which translated into significantly enhanced pass rates.29 In view of the success and networking function of the Short Course, it presented itself as an ideal avenue to address emerging needs among history teachers. But how can something as practical as heritage investigation be taught via distance? As a result of the relatively small size48 of the Short Course, its scattered student base, lack of human and financial resources in the Unisa History Department, and many students' lack of easy access to Internet facilities, sophisticated ODL techniques such as video conferencing, satellite and television broadcasts as well as Web2 applications and MXit49 are not yet viable in this short learning programme. For many of the same reasons face-to-face contact in the form of regular teacher training workshops, although ideal, is also not possible.50 The Short Course therefore relies mainly on a print-based mode of tuition which does not disadvantage any of its students. Although most of the study material and assessment tasks are print-based,54 the tone of written communication is always warm and personal in order to break the isolation which puts ODL students at a distinct disadvantage.55 Short Course candidates also have 24-hour access to the course coordinator via e-mail, SMS and cell phone every day of the week including weekends and public holidays. This has enabled the course coordinator to build close relationships with many history teachers, provide them with immediate didactical support and encouragement, and keep them focused and motivated. In another insert on the same DVD, the teacher who cannot bring his/her learners to Freedom Park in Tshwane/Pretoria, receives video footage of a teacher and her learners on a guided tour of Freedom Park. Another way of "bringing the heritage site to the teacher" should he/she not be able to take the learners on a heritage excursion, is to make photographs of museum or other heritage material available on CD or DVD. These photographs can then be shown in class and/or printed out as sources for a heritage investigation assignment. With the kind cooperation of the Mapungubwe Museum at the University of Pretoria, for example, a fascinating variety of artefacts from the Mapungubwe Collection have been photographed for inclusion on the new "Tips for Teaching Heritage" DVD. The museum has also donated informative brochures which can be used as source material by teachers and learners who may never be able to visit the museum. These brochures will be made available to Short Course students registered for the 2011 academic year. Making our own "movies" is yet another way in which the Short Course team offers teachers resources and fresh ideas for creative heritage investigation. The first of its kind deals with the impact of war on society and technological development and was shot at the Ditshong National Museum of Military History in Johannesburg towards the end of 2010. The story begins with visuals of the war memorial outside the main entrance to the museum with comment on how various communities commemorate the same historical event differently and how interpretations may change over time. It then moves inside to a bust of General Smuts which can be used to make the viewer think critically about the role of powerful military and political leaders in world events. The film then explores the contribution of "ordinary" South Africans such as Job Maseko and Lucas Majozi and reflects on the lack of proper reward for black South African soldiers after World War II. It subsequently shows how their intense bitterness became part of the anti-apartheid struggle as reflected in the Mkhonto we Sizwe collection at the museum. For a more challenging approach to exploring heritage via resistance music, teachers are encouraged to introduce a comparative element by selecting protest music from across the racial and cultural divide. For example, Blondie Makhene's "Siyaya"74 could be combined with some of the late Lucky Dube's reggae lyrics75 and JPre's [John Pretorius] "Sekunjalo Ke Nako" ("Now is the Time"). JPre's song was first performed on the Grand Parade in Cape Town to celebrate Nelson Mandela's release from prison in 1990. It was subsequently used by the African National Congress at election rallies during the 1994 election campaign in the Western Cape, and was later reworked for performance during the 2010 Soccer World Cup.76 Learners may also find the social and political protest of Afrikaner rock musicians such as Johannes Kerkorrelen die GereformeerdeBlues Band77 during the late 1980s fascinating. Celebrated as liberators by the politically progressive section of the Afrikaner youth, but unable to change the racial attitudes of the majority of young Afrikaners,78 Kerkorrel and his band were rejected by the Afrikaner establishment for their "subversive" criticism of apartheid, military conscription and Afrikaner elitism. The band's music was prohibited from being aired by the South African Broadcasting Corporation (SABC) and its "Voëlvry" ["outlawed"] tour of the country banned from most Afrikaans university campuses. Useful protest songs from their albums79 include "Sit dit af" ["Switch it off"], "Wat 'n vriend het ons in PW" ["What a friend do we have in PW"], "Barend vat ons geld" ["Barend takes our money"],80 and "Hou my vas korporaal"["Hold me tight corporal"],which reminds one of the political storm around the Bok van Blerk song, "De La Rey"81 and Jacob Zuma's Awuleth' Umshini Wami ["Bring me my machine gun"] not too long ago.82 Current rock groups such as the Afrikaans punk rock band Fokofpolisiekar ["F...off police car"]83 could also be included, not only because these names may be more familiar to the learners, but also because the material will enable the teacher to illustrate diverse perceptions of identity, the importance of historical context and historical change through time. If none of the above gets the learners excited, ANC Youth League president Julius Malema's singing in public of "dubul' ibhunu" ["Shoot/kill the farmer"] and the heated media and legal debate this has generated,84 certainly will. Ultimately, however, it is about leadership. Not only should academic historians and heritage professionals work together more closely and reach out to history teachers, but the DoE and subject specialists (facilitators) need to provide clearer guidance and support where necessary. History teachers also need to be proactive and take responsibility for their own professional development seeing that the link between good learner performance and inspirational, quality teaching is critical.87 It is therefore up to the teacher to remain inspired, to be creative, to empower him/herself with new knowledge and techniques, and to make every history lesson a memorable experience for both the teacher and the learner. 1 This refers to the Unisa Short Course in School History Enrichment which is offered by the Unisa History Department. 2 Department of History (hereafter DH), Short Course File (hereafter SCF) 5: Q2 - LJ Sekalo, Pretoria. The quotation has been edited slightly. 3 Unlike most international literature which refers to ODL as "open and distance learning", Unisa prefers the term "open distance learning". See JE Mitchell & AI le Roux, "Significant trends in ODL research, as reflected in Progressio", Progressio: South African Journal for Open and Distance Learning Practice, 32(1),2010,p.24,f(2). 4 Examples of excellent heritage projects designed by teachers enrolled for the Unisa Short Course in School History Enrichment include those of E Khosa (Malamulele) on the heritage impact of Mphambo High School; MM Sephuma (Raditshaba) on the Bahananwa and the Leboho chieftaincy; NV Sibawu (Thohoyandou) on the old Grahamstown gaol; V Rietbroek (Roodepoort) on creating a school museum; and LJ Sekalo (Pretoria) on the role of freedom songs as part of South Africa's heritage. See DH: SCF 7, items 1-5. 5 DH: SCF 2: Q29 - JA Peters, Phoenix; Q20 - MB Motsinoni, Ga-Kgapane; Q5 - B Da Silva, Escombe. A Unisa workshop for History teachers from Gauteng West District had to be cancelled as a result of lack of funding for history teacher training in the 2010/2011 DoE budget. See DH: SCF 4: SS Mmotlana (Gauteng Education Department) - H Lubbe (researcher), 1 April 2010. 6 See, for example, teacher despondency around the teaching of the Voortrekker Monument as heritage theme in a post-apartheid South Africa in C Kros, "Public history/heritage: translation, transgression, or more of the same? ", African Studies, 69(1),April 2010,pp.63-77. 7 B Kompi, "Simplifying the assessment of heritage assignment" (Paper, South African Society for History Teaching (SASHT) Conference, Golden Gate, South Africa, 24 September 2010). 8 Interview with L Scott (Internal Moderator, Gauteng, Paper 2) and C O'Neil (Chief Examiner and Chief Assessor, Gauteng, Paper 2), Pretoria, 11 September 2010. 9 B Moreeng, "Exploring heritage in the classroom: towards debalkinising nation building" (Paper, SASHT Conference, Golden Gate, South Africa, 24-25 September 2010). 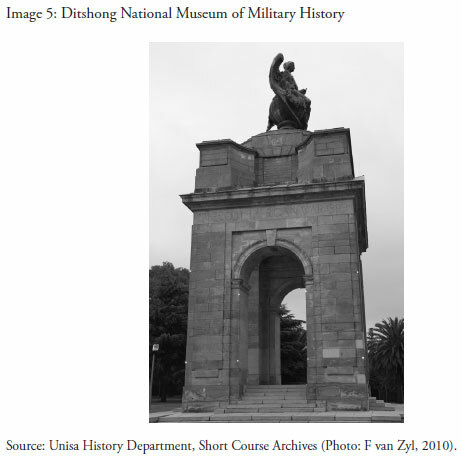 10 J Carruthers & S Krige, Heritage Studies: Only Study Guide for HSY306-Q (Pretoria, Unisa, 2004),pp.10-11. 11 DH: SCF 5: Q1 - LJ Sekalo, Pretoria; Q2 - A Mashamaite, Bochum. 12 DH: SCF 5: Q1 - LJ Sekalo, Pretoria. 13 Department of Basic Education (DoE), Curriculum and Assessment Policy Statement (CAPS ), 2010,pp.33-34. 14 Interview with L Scott and C O'Neil, Pretoria, 11 September 2010. 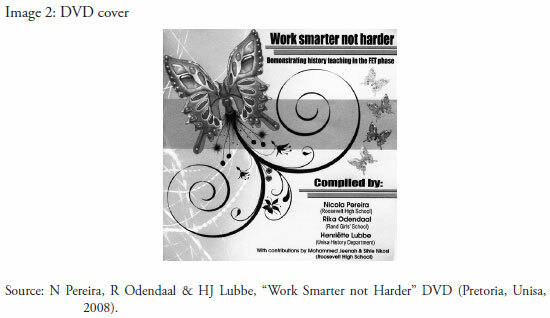 15 For more information on teacher training via ODL, see H Peraton (ed. ), Distance Education for teacher training (New York, Routledge, 1993); P Murphy & A Zhiri (eds), Distance education in Anglophone Africa: experience with secondary education and teacher training (Washington DC, World Bank, 1992); R Neidorf, Teach beyond your reach: an instructor's guide to developing and running successful distance learning classes, workshops, training sessions and more (Medford, NJ, Information Today, c2006); C Vrasidas & GV Glass (eds), Online professional development for teachers (Greenwich, Conn., Information Age Publishers, c2004); D Hayes, In-service teacher development: international perspectives (Hertfordshire, Prentice Hall, 1997), HH Chikuya, "Teacher education within the context of open and distance learning in Zimbabwe: a case study" (Ph. D, Unisa, 2007); DR Bagwandeen, "A study of the provision of distance education for the upgrading and improvement of the qualifications of teachers in the province of Kwazulu-Natal" (D. Ed, Unisa, 1999). 16 P Marais, "Student teachers' experiences of teaching practice through ODL", Progressio, 32(2),2010,pp.181,184-185,197. 17 E du Plessis, "Students' experiences of work-integrated learning in teacher education", Progressio, 32(1),2010,pp.206-221. 18 P Marais, "Student teachers' experiences...", Progressio, 32(2),2010,pp.181,186,196-197. 19 The Unisa Short Course in School History Enrichment is accredited by SAQA and is offered at NQF Level 5. 20 For a critical reflection on the concept of "community" in community heritage projects, see E Waterton & L Smith, "The recognition and misrecognition of community heritage", International Journal of Heritage Studies,16(1-2),January-March 2010,pp.4-15; For debates around community engagement work in the heritage sector and community-heritage engagement as a means of control, see C Perkin, "Beyond the rhetoric: negotiating the politics and realising the potential of community-driven heritage engagement", International Journal of Heritage Studies, 16(1-2),January-March 2010,pp.107-122, and E Crooke, "The politics of community heritage: motivations, authority and control", International Journal of Heritage Studies, 16(1-2),January-March 2010,pp.16-29. 21 See Short Course in School History Enrichment promotional brochure; Unisa History Department website http://www.unisa.ac.za/Default.asp?Cmd=ViewContent&ContentID=157; DH: SCF 1: A Grundlingh (Chair of Department) - C Ware (Chairman of Coca-Cola, Africa), 12 May 1998. 22 For a detailed discussion of the research findings, see HJ Lubbe, "Life on the fringes: the role of the Unisa Short Course in School History Enrichment in empowering teachers", Historia, 55(1),2010,pp.125-140. 23 Respondents were given the choice between submitting their responses anonymously and providing their name. Except for one, all respondents chose the latter and gave permission to be quoted in publications flowing from the research. 24 Option A (History, Grades 11 & 12), Option B (History, Grade 10) and Option C (Social Sciences, Grades 8 & 9). 25 DH: SCF 2: Q20 - MB Motsinoni, Ga-Kgapane; Q7- ZA Gontsana, Mthatha; Q16 - SF Matsoku, Dendron; Q6 - DC Dube, Ekangala; Q10 - PD Leboea, Matatiele; Q11- MM Mailula, Polokwane; Q12 - LK Magagula, Sibuyile; Q13 - S Maluleke, Elliot; Q15 - VM Maphiri, Hamakuya; Q19 - NJ Mosetlhe, Taung Station, to mention but a few. 26 DH: SCF 2: Q1 - M Badat, Middelburg, Mpumalanga; Q25 - VH Ndlovu, Cato Ridge; Q27 - MZ Nkosi, Nongoma. 27 DH: SCF 2: Q10 - PD Leboea, Matatiele; Q12 - LK Magagula, Sibuyile; Q15 - VM Maphiri, Hamakuya; Q23 - T Mtshali, Kwangwanase. 28 DH: SCF 2: Q5 - B Da Silva, Escombe; Q10 - PD Leboea, Matatiele; Q11 - MM Mailula, Polokwane; Q29 - JA Peters, Phoenix; Q6 - DC Dube, Ekangala; Q24 - SL Mzila, Lady Frere; Q25 - VH Ndlovu, Cato Ridge; Q34 - TR Zindela, Dimbaza; SCF 3: M Badat, Middelburg, Mpumalanga, in a personal note (undated) included in an assignment. 29 SMS: NS Maxengana (student)/H Lubbe (researcher), December 2009 (69% improvement); DH: SCF 2: Q30 - ZB Poswa, Vanderbijlpark (between 60 % and 70 % improvement). Significantly improved pass rates were reported in a follow-up research project in 2010 when 12 of the 16 respondents (n=36; response rate 44,4%) reported significantly improved pass rates; the remaining 4 respondents either taught at schools where history had been phased out or worked in the heritage sector. See DH: SCF 12: items 1 to 16. 30 This refers to a convenience sample of 90 which represented all the teachers who had completed the Short Course between 2006 and 2009 and could be handled by only one researcher. Lack of human and financial resources made a quantitative analysis of the collected data impossible. 31 DH: SCF 2: Q24 - SL Mzila, Lady Frere; Q6 - DC Dube, Ekangala; Q21 - FS Motsoeneng, Three Rivers; Q36 - Anonymous; Q13 - S Maluleke, Elliot; Q9 - M Lancaster, Grahamstown. 32 DH: SCF 5: Student feedback (heritage), 2010. 33 The lecturer who invited student feedback on History I modules towards the end of 2010 reported a similar experience for probably the same reason. 34 DH: SCF 6: Student feedback (heritage), 2011. 35 DH: SCF 5: Q2 - A Mashamaite, Bochum. 36 DH: SCF 5: Q1 - LJ Sekalo, Pretoria. 37 DH: SCF 5: Q1 - LJ Sekalo, Pretoria; Q2 - A Mashamaite, Bochum. 38 DH: SCF 5: Q1 - LJ Sekalo, Pretoria. 39 DH: SCF 5: Q2 - A Mashamaite, Bochum. 40 DH: SCF 5: Q1 - LJ Sekalo, Pretoria; Q2 - A Mashamaite, Bochum. 41 TS van Eeden & JB Dewar, "Exploring evaluation practices in developing a distance educational DVD", Progressio, 32(2),2010,p.65. 42 See EO de Munnik, "Media-futurologie in afstandsonderrig", Progressio, 14(1),April 1992,pp.50-57; T Bates, Technology, open learning, and distance education (New York, Routledge, 1995); T Bates, Technology, e-learning and distance education (London & New York, Routledge, 2005); EO de Munnik, Listening and learning: a students' guide to the use of audio-print materials in distance education (Pretoria, Unisa, c1993). 43 See KL Harris, "To go on air or on tape? : the role of audio cassettes and radio broadcasts at Unisa", Progressio, 16(1),July 1994,pp.88-97; KP Quan-Baffour, "The introduction of audio cassettes in an integrated study package in solving the problems of adult distance education students in Lesotho (M. Ed, Unisa,1995). 44 See EO de Munnik, "Evaluating radio broadcasts", Progressio, 14(2),January 1992,pp.20-24. 45 See EO de Munnik, "Some ideas on the use of television in distance teaching", Progressio, 10(1),November 1988,pp.143-149; EO de Munnik, "First step towards educational broadcast television? ", Progressio, 14(2),January 1992,pp.11-18. 46 For the advantages of video/DVD in practical skills training, see TS van Eeden & JB Dewar, "Exploring evaluation practices in developing a distance educational DVD", Progressio, 32(2),2010,p.67. 47 Use of myUnisa is currently characterised by "insufficient meaningful interaction" and a "lack of depth" in terms of e-learning. See B Mbatha & L Naidoo, "Problems hampering the collapse of distance in ODL", Progressio, 32(1),2010,pp.174-183. 48 In the first two years (1999 and 2000) the course attracted 120 and 90 enrolments respectively. Student numbers subsequently declined as a result of growing pressure on the historical discipline and the phasing out of history at many secondary schools across South Africa. However, course registrations remained relatively stable throughout the 2000s varying between 30 and 50 enrolments per year. See DH: Student statistics, 1995 to the present. 49 For more information on the advantages and disadvantages of MXit, see AA van Rooyen, "Integrating MXit into a distance education Accounting module", Progressio, 32(2),2010,pp.52-64. 50 HJ Lubbe, "Life on the fringes...", Historia, 55(1),2010,p.132. 51 For an overview of educational changes in South Africa after 1994, see DA Black, "Changing Perceptions of History Education in Black Secondary Schools with special reference to Mpumalanga, 1948-2008" (MA , Unisa, 2009), Chapter 5. 52 See National Curriculum Statement, Grades 10-12 (General), History (Pretoria, Department of Education, 2003); National Curriculum Statement, Grades 10-12: Subject Guidelines: History (Pretoria, Department of Education, 2008); Curriculum and Assessment Policy Statement (CAPS ) (Pretoria, Department of Basic Education, 2010). 53 HJ Lubbe, "Life on the fringes...", Historia, 55(1),2010,pp.130-1. 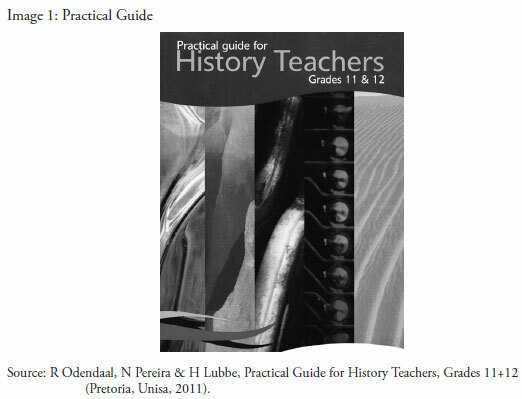 54 N Pereira, R Odendaal & H Lubbe (compilers), Practical Guide for History Teachers, Grades 11&12 (Pretoria, Unisa, 2007); N Pereira & H Lubbe (compilers), Practical Guide for History Teachers, Grade 10 (Pretoria, Unisa, 2008); R Odendaal, N Pereira & H Lubbe (compilers), Practical Guide for Social Science Teachers, Grades 8&9 (Pretoria, Unisa, 2008); Tutorial Letter 101for SCHE016 (Pretoria, Unisa, 2011). 55 For interesting arguments around the needs of more interpersonally oriented learners with an African cultural background, see M Qakisa-Makoe, "Reaching out: supporting black learners in distance education", Progressio, 27(1&2),2005,pp.44-61. 56 Tutorial Letter 101for SCHE016 (Option A), p.14; Tutorial Letter 101for SCHE016 (Option B), p.12; Tutorial Letter 101for SCHE016 (Option C), p.13. 57 See DH: SCF 8 (Assessor reports, 2010-2011). 58 DH: XMO Report for SCHE016, 2010. 59 DH: SCF 9 (Minutes of meetings with tutors): E-meeting with T Rossouw, 4 June 2010; meeting with J Moti and P Pillay, Laudium, Pretoria, 5 March 2011. 60 For critical reflections on the role of technology in ODL in view of huge disparities in terms of student access to technology, see JF Heydenrych & P Prinsloo, "Revisiting the five generations of distance education: quo vadis? ", Progressio, 32(1),2010,pp.5,11,22-23; IM Ntshoe, "Realigning visions and missions of universities in a transbinary setting", Progressio, 32(1),2010,pp.27,39; MC Cant & CH Bothma, "The learning-technology conundrum: lecturers' perspectives", Progressio, 32(1),2010,pp.63,66-69; BT Mbatha & L Naidoo, "Problems hampering the collapse of distance in ODL", Progressio, 32(1),2010,p.182. 61 "First Aid for FET"(Pretoria, Unisa, 2007); "Short Cuts to Teaching Social Science" (Pretoria, Unisa, 2008); "Work Smarter Not Harder" (Pretoria, Unisa, 2008); "Tips for Teaching Heritage" (Pretoria, Unisa, forthcoming). 62 DH: SCF 10 (CD/DVD sales). 63 See "First Aid for FET" DVD and accompanying CD, insert 4. 64 See "First Aid for FET" DVD and accompanying CD, insert 5. 65 S Tiley, Mapungubwe: South Africa's Crown Jewels (Cape Town, Sunbird Publishing, 2004); TN Huffman, Mapungubwe: Ancient African Civilisation on the Limpopo (Johannesburg, Wits University Press, 2005). 66 See, for example, http://www.sahistory.org.za/pages/artsmediaculture/protest_art/archive/arch.htm; http://www.archivalplatform.org/, as accessed on 1 September 2010. 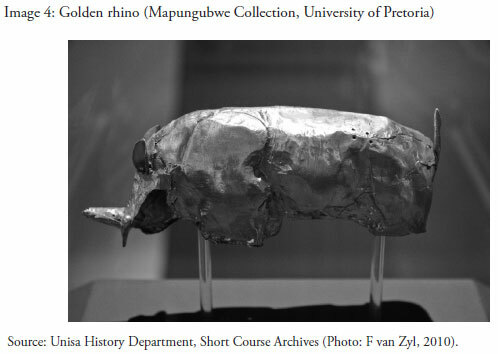 67 "Heritage investigation: Mapungubwe" designed by Short Course tutor T Rossouw, Crawford College, Pretoria, 2010. 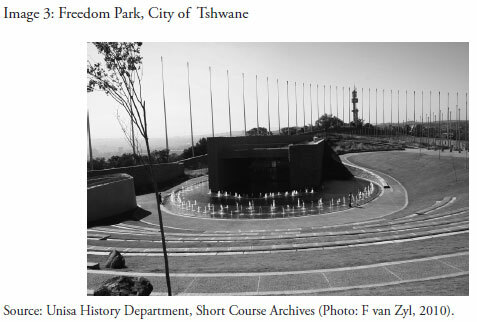 68 See "Tips for Teaching Heritage" (Pretoria, Unisa, forthcoming); "Heritage investigation: Military Museum" designed by Short Course tutor T Rossouw, Crawford College, Pretoria, 2010. 69 KA Hlongwane, S Ndlovu & M Mutloatse (eds), Soweto '76 (Houghton, Mutloatse Arts Heritage Trust, 2006). 70 DH: SCF 7: V Rietbroek, Assignment 03 for SCHE016 (2010). 71 DH: SCF 7: J Sekalo, Assignments 03 and 07 for SCHE016 (2010). 72 See, for example, http://www.sahistory.org.za/pages/artsmediaculture/protest_art/archive/arch.htm; http://www.archivalplatform.org/, as accessed on 1 September 2010. 73 See http://www.archivalplatform.org/news/entry/criminalizing_struggle/, as accessed on 1 September 2010. 74 Blondie Makhene, "Amaqabane", Track 12 ("Siyaya"). 75 Listen to Lucky Dube's "Think about the Children" (c. 1987/8), "Prisoner" (1989), "Captured Live" (1990), "House of Exile" (1991) and "Victims" (1993). 76 M Peters, "JPre looks to 2010, launches new album ["Listen Up"]", Cape Argus, 7 March 2009 (available at http://www.capeargus.co.za/index.php?fArticleId=4876735, as accessed on 20 July 2010). 77 Johannes Kerkorrel is the performing name of the late Ralph Rabie. "Kerkorrel" literally means "church organ" and "Gereformeerde" means "Reformed", referring to the Dutch Reformed Church. 78 A Grundlingh, "Skiet die (vul iets hier in)", Die Burger, 19 February 2011 (available at http://www.dieburger.com, as accessed on 14 April 2011). 79 Johannes Kerkorrel en die Gereformeerde Blues Band, "Eet Kreef" ["Eat Crayfish"], 1989; Various artists, "Voëlvry: Die Toer" ["Outlawed: The Tour"]. 80 This refers to former Minister of Finance, Barend du Plessis, who used tax payers' money to finance the oppressive apartheid system. 81 See A Bezuidenhout, "From Voëlvry to De la Rey: Popular music, Afrikaner nationalism and lost irony" (available at http://www.litnet.co.za/cgi-bin/giga.cgi?cmd=print_article@news_id=11123&cause_id=163, as accessed on 26 August 2010); A Grundlingh, "Rocking the boat in South Africa? Voëlvry music and Afrikaans anti-apartheid social protest in the eighties", International Journal of African Historical Studies, 37(3), 2004, p. 483 ff; P Hopkins, Voëlvry: the movement that rocked South Africa (Cape Town, Zebra Press, 2006). 82 See E Gunner, "Jacob Zuma, the social body and the unruly power of song", African Affairs, 108(430),2009,pp.27-48. 83 Listen to albums such as "Lugsteuring"["Air Disturbance"](2004), "Monoloog in Stereo" ["Monologue in Stereo"] (2005), "Swanesang" ["Swan Song"] (2006) and "Antibiotika" ["Antibiotics"] (2008) and watch the documentary about the band entitled "Forgive them for they know not what they do" (2009). 84 See, for example, the statement by Advocate S Mancotywa (CEO of the National Heritage Council) in "National Heritage Council: criminalizing struggle songs is inconsiderate" (available at http://www.archivalplatform.org/news/entry/criminalizing_struggle/, as accessed on 1 September 2010); S Masondo, "ANC defends struggle songs", Sunday Times, 30 March 2010 and S Msomi, "It's time to sing 'Heal the Boer'", Sunday Times, 16 March 2010 (both available at http://www.timeslive.co.za, as accessed on 4 April 2011); R Azzakani, "Malema is onversetlik oor lied", Die Burger, 27 January 2011; J Botha, "Skiet die Boer is nes De la Rey", Die Burger, 25 February 2011; J Keogh, "Malema se lied 'nie uit die struggle'", Die Burger, 14 April 2011 (all available at http://www.dieburger.com, as accessed on 14 April 2011). 85 See "Tips for Teaching Heritage" (Pretoria, Unisa, forthcoming): Group work activity developed by R Odendaal, Johannesburg, 2011. 86 DH: Short Course File 4: Q5 - S Maluleke, Lady Frere. 87 See also R King, "Be passionate about history - marketing history to learners and parents", Yesterday&Today, Special Edition, 2006,pp.33-38.